Description: Gandalf the Grey appeared to mortal Men in the form of a tall man, bent with age and sporting a long flowing beard. 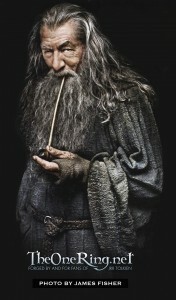 Professor Tolkien describes Gandalf's ability to appear outwardly to others as nothing more than a ratty old conjuror (in many ways disguising his true powers), such that when Bilbo first encounters the wizard in the opening pages of The Hobbit he writes: "All that unsuspecting Bilbo saw that morning was an old man with a staff. He had a tall pointed blue hat, a long grey cloak, a silver scarf over which his long white beard hung down below his waist, and immense black boots." 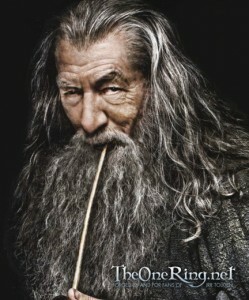 Gandalf is also noted to have distinctly bushy eyebrows. After his encounter with the Balrog on 15 January T.A. 3019, Gandalf the Grey returned in renewed corporeal form as Gandalf the White, after which he dressed in strikingly white robes. Gandalf began his long history as one of the angelic beings living in the Undying Lands of Valinor, where the Elves named him Olórin (Quenya). As a Maiar spirit, he was sent to Middle-earth in the guise of an old man to assist the Free Peoples in their struggles against the Dark Lord. After his arrival at the Grey Havens sometime around T.A. 1000, various races gave him distinct names (such as Mithrandir, a Sindarin name, and Gandalf, a moniker from the Men of the North). When Gandalf first appeared he was given the Elven Ring of Fire, Narya, as a gift from Círdan. 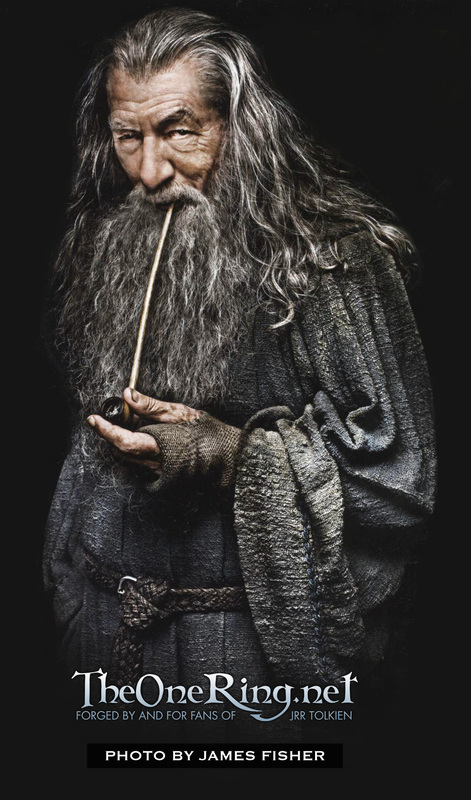 He was part of a group of five Istari, known to Men as wizards, but only three (Radagast, Gandalf, and Saruman) stayed within Middle-earth to play active roles during the War of the Ring. Gandalf endured many difficult trials and adventures during his time in Middle-earth. Strangely, he never took a permanent residence, thus earning nicknames such as “Grey Wanderer.” He was an important member of the White Council; making strategic decisions alongside Elrond Half-elven, Galadriel, and Saruman. He built many careful relationships over time with great lords and leaders of Dwarves, Men, and Elves; knowing that cultivating these would lead to greater resistance against Sauron. During the War of the Ring, Gandalf’s presence was not always welcome, as he was considered a grand manipulator and meddler by those who mistrusted his maneuverings. He was very fond of Hobbits, being perhaps the only one of the Wise who actually took notice of them. Gandalf also developed a colorful reputation in the Shire, as Bilbo remarks: “Not the Gandalf who was responsible for so many quiet lads and lasses going off into the Blue for mad adventures?” The wizard managed to bring Thorin II out of obscurity and stagnation, mobilizing him and his Dwarven kin to seek the Lonely Mountain and attempt to eradicate the dragon Smaug (a quest for which Gandalf also recruited Bilbo — an act of foresight that would change everything). Gandalf was greatly learned in history, languages, and magic. He most often used his powers indirectly to offer counsel and fair influence on the hearts of Men. His innate ability to inspire those he met was undoubtedly enhanced by Narya — it should be noted the Istari were forbidden to oppose Sauron with direct force. Gandalf was supremely challenged by the betrayal of his superior, Saruman, and ended up replacing him in the order of the Istari (and the White Council). Analysis: The role of Gandalf was previously voiced by William Squire in the 1978 Ralph Bakshi animated adaptation of LOTR; John Huston in the 1977 and 1979 cartoons of The Hobbit and The Return of the King; and Michael Hordern and Norman Shelley, respectively, in the 1981 and 1955 BBC radio adaptations of LOTR. Gandalf is perhaps the most widely recognized Tolkien character that appears in both major works The Hobbit and The Lord of the Rings. Working tirelessly for many centuries towards defeating Sauron, Gandalf used his keen foresight and fiery magical abilities to bring hope to the hearts of Men; making him arguably the most influential character who contributed to the victory of the West in the Third Age. To those closest to him, particularly the Hobbit characters, Gandalf’s gentle, avuncular manner belied his awesome power over the Unseen. When faced with a critical task, Gandalf could change frighteningly by revealing a glimpse of his inner power.